In 1970, the area surrounding the Hampton Coliseum wasn’t much more than a vast stretch of farmland. The construction of the Coliseum started an explosion of retail development. Today, the retail sector surrounding the Coliseum boasts numerous free-standing superstores, four strip malls and the Peninsula’s largest shopping center. There are over 1,500 hotel rooms in the area, up from 80 in 1970. 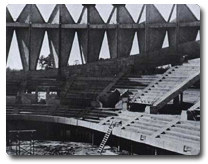 The contract for construction of the Hampton Coliseum was awarded by City Council to general contractors, McDevitt and Street Co., of Charlotte, North Carolina, on April 24, 1968. The base contract was for $6,233,000.00, about a million dollars more than had been anticipated through the cost projections at the time the bids were called. Additional items approved by Council brought the total contract for McDevitt and Street to $6,528,000.00. 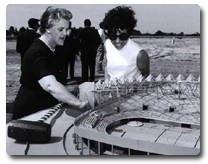 Original cost estimates had placed the cost of the Coliseum at $4.5 million, which was increased to $5.1 million in July 1967, plus an additional $1.4 million for the surrounding ground and park area. The estimated final cost averaged $8.5 million to $9 million. 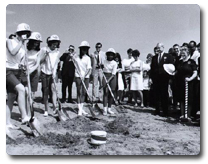 Actual construction was begun with a traditional ground breaking ceremony May 24, 1968, one month afterthe contact was awarded, with Mayor Ann H. Kilgore driving a candy-stripped piling into the ground. Vice Mayor Tom G. Waters and Councilman Charles A. Wornom assisted. The site clearing had begun much earlier, on March 21, 1967, and the site was ready for the first phases of construction by the time the piling was driven. Testing of the massive structure’s approximately 1,200 wood and concrete pilings was completed prior to June 21, 1968, and, at that point, work was progressing according to, if not ahead of, schedule. Approximately 30 sub-contractors were involved in the construction. 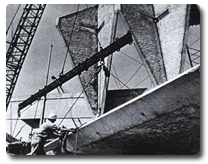 McDevitt and Street Co. poured on the site 96 exterior triangular – shaped concrete wall panels, each weighing approximately 26 tons. Each panel was pelted with stones to give a speckled appearance. Also cast on the site by the general contractor were 700 concrete bleacher sections, weighing from one to three tons each. In all, 17,000 cubic yards of concrete were used for the structure, including 300 cubic yards for the arena floor alone. The floor contains nearly 10 miles of coolant coil for freezing the ice rink. The floor of the arena is almost the size of a football field. On November 26, 1968, City Manager C. E. Johnson announced construction was on schedule and approximately $2 million already had been paid to the contractor, excluding cost of work accomplished by city crews. 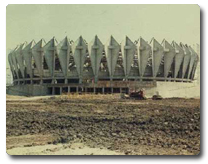 The Coliseum was reported 25 per cent completed in mid-December 1968, and the halfway point was reached with the installation of the roof on July 1, 1969. There are 500 tons of structural steel in the roof, plus 250 tons of metal decking and approximately 50 tons of roofing material with a vinyl membrane covering. The complete cable-suspended roof is held by 48 two-inch bridge cables. Each cable was tested and stressed prior to installation at 200 tons. Lighting was installed by E. C. Ernst electrical contractors on a bid of $48,661.00, not including more than $50,000.00 worth of light poles and walkway standards purchased by the city. The exterior lighting, in addition to 24 special walkway lights illuminating the 166,000 square feet of exposed aggregate concrete walks and promenades, consists of five 125-foot-high aluminum poles each holding from four to twelve lights. The lights themselves, 47 in all, are 1,000 watt metallic vapor lights and are serviced by a portable cable elevator. Interior lighting, also by E. C. Ernst, consists of 1,909 light fixtures of all types plus an additional 52 fixtures under water in the pool and lake. 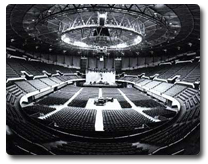 There are a total of 256 fixtures in the arena proper with a total output of 256,000 watts for such activities as basketball, hockey and stage events with an additional 48,000 watts of lighting for seating and emergency purposes.